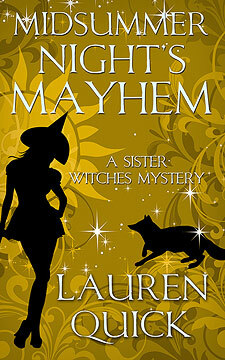 Teeming with mystery, mayhem, and the trio of cunning sister witches, A Midsummer Night's Mayhem is a paranormal mystery with wicked twists to keep you guessing. In the witching world of Everland, Clover Mayhem lives a quiet life in the Meadowlands, only capturing the attention of her neighbors once a year when she hosts her popular summer solstice party. And that's just the way she likes it. But there is much more to Clover Mayhem than meets the eye. Thanks to her secret magical persuasion as a word witch, she is also Cassandra Reason, one of Everland's most successful romance novelists. However, when Clover discovers her cantankerous neighbor, Oliver Yearling, has been murdered in her yard during the party, her secret identity is in jeopardy. Even worse, Clover finds herself one of the prime suspects. To clear her name and keep her persuasion a secret, Clover is on the case, digging up clues and making strange discoveries about the victim. When the validity of Oliver's will comes into question, Clover soon finds herself investigating friends and neighbors alike, all while butting heads with local law enforcement, who are desperate to know what Clover's hiding from them. Who in Everland wanted Oliver dead? Could it be the local farmers who lost their crops and desperately need more land? Was Oliver's son, Austin, angry enough over the potential loss of his inheritance to kill? And who is Oliver's secret love? With the help of her trusty assistant, Derek, and her sisters, Vivi and Honora, Clover must navigate a growing list of suspects, one of whom is using black magic to scare her off the case, to find the real murderer and protect her secret.